The sports scene has shifted away from one world stage and is now preparing for another one. With the 2016 Summer Olympics completed, the next big international event is the upcoming 2016 World Cup of Hockey. 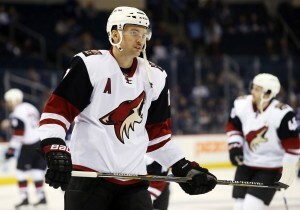 The rosters are filled with Arizona Coyotes players who have previous international playing experience. Here is a look back at some of their performances on the world stage. One of Arizona’s top-scoring defenseman, Ekman-Larsson has been a potent weapon from Sweden’s blue line as well. Ekman-Larsson had his highest point total in international play during the 2015 IIHF World Championship with 12 (two goals and 10 assists). He has a pair of silver medals in his international career from the 2014 Winter Olympics in Sochi and the 2011 World Championship in Slovakia. Now, Ekman-Larsson looked to add a World Cup of Hockey championship to his list of hardware. Hanzal has represented the Czech Republic twice in the last three years. He had a goal and three assists in the 2013 World Championship and picked up an assist during the 2014 Winter Olympics. Including his time in the IIHF World Junior Championships, Hanzal has recorded three goals and 10 assists in 30 games with the Czech national team since 2006. Hanzal has not had the same success as Ekman-Larsson in international play, but the Czech forward is looking to change that this month. During his NHL career, Michalek has been more known for his defensive playmaking and shot blocking instead of his offensive capabilities. The Czech defenseman has scored 42 goals in 781 career NHL games and has not scored more than two goals in each of the last five seasons. However, Michalek has scored six goals in 39 games with the Czech Republic at the World Championship, including three during the 2013 tournament. He has a pair of medals in his career, most recently in 2011 when he received a bronze in the World Championship along with former Coyote Petr Prucha. Rieder is one of a handful of quality NHL players that Germany has produced in recent years. The young forward has also stepped up in the international spotlight as a member of Team Germany in the last four years. Rieder collected three goals and two assists in six games at the 2013 World Junior Championship. He has followed that with two goals and four assists in the last three World Championship tournaments. After recovering from a knee injury in this year’s World Championship, Rieder will get a chance to represent Team Europe at the World Cup of Hockey.